Working with JungleMail for Office 365 you can give different users different sets of permissions. This can be a useful feature if you want only a select few to be able to modify JungleMail 365's settings, and a certain number to be able to create and send campaigns. 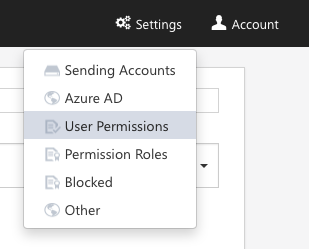 In this tutorial, you will learn how to configure user permissions. Note: you should have an Administrator permission role to see and modify these settings. In order to grant or limit user access to the JungleMail 365 app, you will need to change user permissions by adding roles to specific users. To start, open the app. Now click on Settings in the top right corner and select User Permissions. Here you will be able to add new users, remove users, and modify the permissions for existing users. Also, read our tutorial about creating user permissions to learn how to create and edit permissions for JungleMail 365 users. Did this answer your question? Thanks for the feedback There was a problem submitting your feedback. Please try again later.